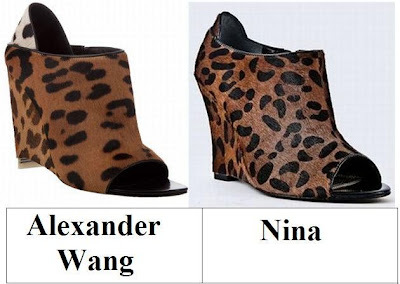 My loves, on the left we have Alexander Wang’s fierce Alla Leopard Peep-Toe Wedges, the very same ones seen countless times on Khloe Kardashian; to the right you will find Nina’s Yaneli High Wedge Shoe. Though the hot to trot Nina’s proffer an ever so slightly lower heel height than the Wang wonders; for just $109.95, as opposed to the $650.00 price tag of their couture cousins, they are every bit as capable of helping the fashionable femme fatale that is vous take a walk on the wild side – at a price that doesn’t break the bank! Thanks to Net-A-Porter and DNA Footwear for the pictures. Oooooooo I love a leopard shoe!!! I love wedges too. I like the Wang one because it looks like it's made better!! I find Nina's a bit neater, actually. So sweet the price...for Nina's. Hmmmmm might have to splurge on this one because of the two-tone aspect of the Alexander Wangs... But those Ninas are certainly a fab find! ooh la la..wow, I'd go on the cheap, which might be too expensive for me. But they are so cool. BTW- I have to agree...your blog template is the essence of Cafe Fashionista! I love both but they cheaper one seems just as awesome. And expensive enough that they wont hurt my feel too much. Yay for prints! I would def go with the thrifty version!!!! I much prefer the Nina ones. I prefer the Nina ones. love the nina ones! great find as always darling! I actually like the look of Nina's better! Once again, great find! hmm...you always pose the tough challenges..I WANT to say WANG all the way...BUT I think since the leopard she is more if a trend than a timeless classic, I am going to go thrifty on this one. Completely in love with the Nina ones. Before I was not sure about the leopard print but now I must have. Thanks for another great find. Leopard print heels and wedges are a bit out there for me but these are super darling! The Wangs get my vote on this one. SO fabulous! I'm not very fond of leopard print, but I think the Alexander Wang shoes are definitely much more worth spending the money. Omg CUUUUUTE!! Where were these when I was shopping for my Josie and the PUssycats costume?! Too cute! The Nina shoe just doesn't look as nice? I'd splurge! oh. count. me. in. i love love love leopard print!!! it's so much fun to wear. in fact, yesterday i sported leopard leggings with boots and a cute hot red top. i love leopard! and these are so perfect! I'd totally get the Nina pair..but i love the 2-tone colors of the Wang pair. Lovely! The nina ones for sure!! I like the Alexander Wang shoe better! I wouldn't buy the Nina. It's not ugly, I just don't like how rough it looks! Can I be greedy and say both? Please? I don't have enough leopard print in my closet. I am not talented enough to walk in those! I'm gonna get suckered this week. I really like the Wang's! i would have to go for the alexander wang ones.. i love them! I love the Alexander Wang wedges. Gorgeous! I like the Alexander Wang version! So cute, great find! I must say I love the leopard trend and observing ever stylish femme fatales on the prowl in Gotham's concrete jungles sporting them. I like both, but the Alexander Wang prevails because of the alternate pattern above the heel which is very eye catching. (I also love the leopard jacket in the photo of the previous post). Wow I really love the Nina ones. Please, please let them show up in my TJMaxx or Ross!!! A Wang! You know, I've noticed that when going with animal print, nothing beats the designers. I don't like that back part on Wang's shoe. I don't see why everyone is crazy about it. It looks cheap. I like the cheaper version, and closed toe would be a bit more efficient this time of year in these parts. that's a really awesome steal ! The Nina shoes have been on my radar and I think I'm going to get them. They're just too good to not pass up! Did you buy them too?! the nina pair could easily pass as the alexander wang's!! Practically the same shoe! Amazing! You can never go wrong with Leopard print wedges!! I definitely prefer the Nina ones! Ooh, those are soo cute! I'd take the Nina's. Love the shoes. I have a pair nina shoes that have been very good to me. They are such a well structured brand. oooo Those are so cute!! I like the nina ones!